Becoming a Certified Nursing Assistant (CNA) in New Jersey requires completing a state approved training program and/or passing the National Nurse Aide Assessment Program (NNAAP) Examination. The New Jersey Department of Health & Senior Services (NJDHSS) is the oversight agency. Understanding and carefully following certification requirements is critical to successfully getting a name entered into the Nurse Aide Registry, a requirement for having the right to use the CNA designation. The following sections describe the basic steps, from selecting the best path to CNA certification in New Jersey to maintaining an active New Jersey Nurse Aide Registry listing once certified. There are various routes leading to certification as a nurse aide in New Jersey. Some require completing a state-approved training program and passing the National Nurse Aide Assessment Program (NNAAP) examination, while other routes recognize previous training and only require passing the CNA examination. In New Jersey, the training program and examination together are referred to as the “Nurse Aide in Long-Term Care Facilities Training and Competency Evaluation Program.” This is the same as the NATCEP or Nurse Aide Training and Competency Evaluation Program. The first step is identifying the best path an individual should choose based on personal qualifications and status. Following are the seven routes to Certified Nurse Aide certification in New Jersey. A new nurse aide must successfully complete a state-approved training program and pass the NNAAP examination. A student nurse who can provide verification of having successfully completing the Fundamentals of Nursing course within the last 12 months can apply to take the NNAAP examination. A graduate nurse who completed an accredited nursing program, but has not taken the state nursing board exams, can provide proof of training and apply to take the NNAAP examination. A nurse who graduated from a foreign school, and is a licensed Registered Nurse in that country, can also apply to take the NNAAP examination. A person who is certified as a nurse aide in good standing in another state, and has never had certification revoked, can apply for reciprocity. If approved, it is only necessary to take the NNAAP examination. Not all states are recognized for reciprocity purposes, so it is important to verify the state of training is not on the list of exclusions. A person who has nurse aide training and experience that was obtained while in the military can request to take the NNAAP examination. A person who has completed a state-approved Personal Care Assistant (PCA) training course can apply to take the nurse aide examination. A person who was certified as a New Jersey nurse aide more than five years ago and has a lapsed (expired) certificate, must retrain and retest. A person who was certified as a New Jersey nurse aide less than five years ago, and has a lapsed (expired) certificate, must retake the examination. If the individual fails either part of the two-part exam, it is necessary to retrain and retest. New Jersey certified Homemaker-Home Health Aides who can document completion of the of the Long-Term Care portion of the core CNA curriculum for unlicensed assistive personnel can also apply to take the CNA exam. 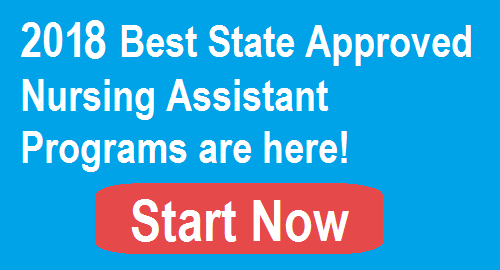 With 113 state-approved CNA programs in New Jersey, it is usually easy to find a program that is nearby or easily accessible, and is able to meet personal requirements. Training programs are offered at county vocational schools, private vocational schools, community colleges and high schools. CNA training programs are also offered at long-term care facilities, giving the student the opportunity to work and train at the same time. Federal laws limit the working period to 120 days or four months without certification. The school directory is updated in November 2017. Dover Morris Ace Health Care Training Institute, Inc.
Union Union Ace Health Care Training Institute, Inc. The State of New Jersey requires a state-approved training program to consist of a minimum of 90 hours of training. The 90 hours includes 50 hours of classroom instruction and 40 hours of clinical training in a nursing home or other long-term care facility. As long as the training program meets minimum hours and curriculum requirements, it can set its own schedule for CNA classes in New Jersey. For example, The Health Care Training Institute of New Jersey in Union offers a 2-month weekday program and a 3-month weekend program. The Camden County College Certified Nurse Aide Program is a 1-semester, 4-credit course offered on the Camden or Blackwood campuses. A semester program will take several months to complete. Since it awards college credit, the credits can be applied to a degree program at a later date. However, the program is only offered during the daytime hours. The costs of programs vary. The Atlantic Cape Community College charges $2,091 for tuition and $944 for textbooks and supplies for a total of $3,035. The Camden County College charges $939 for tuition and fees, course fee and instruction free for the Nurse Aide training program. There are likely to be additional costs for items like uniforms. All students cover the costs associated with meeting prerequisites, like TB testing. Students should ensure they understand what is included in tuition and fees, and the additional costs, if any. Financial aid is usually only available for credit courses. However, it is always important to inquire about potential funding sources such as workforce training funds. Some schools can also steer students to scholarship opportunities. One way to get free training is to work at a long-term care facility while training. Federal and state laws require the employer to cover the cost of training, including textbooks. If a CNA is employed by a long-term care facility within 12 months of certification, the employer is required to reimburse the employee for reasonable training costs. Some schools will require getting approval for admission to the school first and then signing up for the Certified Nurse Aide course. Within each topic, detailed discussions on delivering nurse aide services are thoroughly covered. Students also learn hands-on skills during lab and clinical training. The skills training covers topics like using assistive devices, handwashing, assisting residents with dressing and grooming, measuring and record bodily fluids, feeding, working with residents on range of motion and many others. The New Jersey Department of Health and Social Services has contracted with PSI to administer the CNA exam. An applicant must take the examination within two years of completing a training program. The exam has two parts: Written/Oral and Skills Evaluation. It is necessary to pass both parts of the exam within one year from the date the training program was successfully completed. If unable to pass both parts of the exam within one year, it is necessary to restart the entire process based on the route. The Skills Evaluation exam is administered at a long-term care facility or other approved site. It must be taken and passed before individuals are allowed to take the Written/Oral exam. Applicants get three attempts. If unable to pass within three attempts, retraining is required. Individuals are given five skills tasks to complete, and one is always handwashing. It is necessary to get a score of 80 percent for each skill in order to pass the Skills Evaluation. Failing any single skill means the person will have to retake the entire Skills Evaluation exam. The Written/Oral Exam is administered via computer. An applicant also has three attempts to pass this exam part. If unable to do so within three attempts, it is necessary to retrain. There are 60 questions. The minimum passing score is 75 percent. Before applying for certification as a new nurse aide, New Jersey requires the individual to complete a Criminal Background Investigation (CBI) with fingerprinting. PSI has various examination site locations. Before applying for certification as a new nurse aide, New Jersey requires the individual to complete a Criminal Background Investigation (CBI) with fingerprinting. Anyone who completes CNA training will receive the CBI and fingerprinting forms from the program instructor. Reciprocity applicants will go through the CBI and fingerprinting process as part of the process of applying for reciprocity. Anyone applying for CNA certification via a waiver route will receive the necessary forms for the CBI and fingerprinting from the NJDHSS. Once an applicant has passed both parts of the nurse aide exam and completed the CBI process, he or she receives a nurse aide certificate, and the person’s name is entered on the New Jersey Nurse Aide Registry. Certification is valid for two years (24 months) from the date an individual passes the Written/Oral examination. To renew CNA certification, the CNA must provide verification of employment for pay of at least seven hours within the two-year certification period. As part of the recertification process, the NJDHSS will update the CBI.